Those of us with children know that when you have kids they grow out of things faster than you can blink an eye especially before age 5. Its amazing to me how quickly time flashes by. I just try my hardest to cherish each and every moment as it goes by and regret nothing! One thing I have noticed that seems to have been a consistent for my oldest son Dane, is his love and fondness for dinosaurs. We really expected him to grow out of them as soon as we were done decorating his room (like most children do) and oddly enough he's still in love three years later and now of course his brother has become a fan of them as well. I was pretty excited when The Jim Henson Company contacted me asking if I would be interested in reviewing any products from Dinosaur Train on PBS. Ummm...yes!! 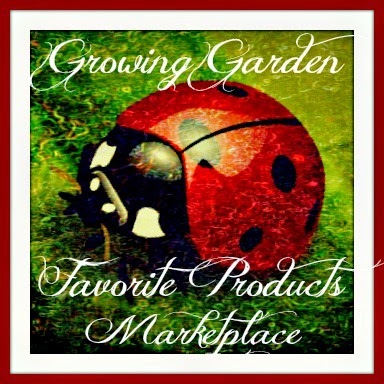 My children are obsessed and I am positive they'd love to share their thoughts on Mommy's new review products! 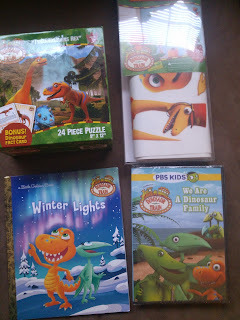 We were sent over a variety of Dinosaur Train fun including the Winter Lights Little Golden Book, Peel n Stick Wall Decals from RoomMates, a 24-Piece Jigsaw Puzzle - “Troodon”, and Dinosaur Train: We are a Dinosaur Family DVD. When everything initially arrived the boys were so excited that they weren't quite sure what they wanted to open and test out first! Being that have recently taken back up the family fun activity of putting puzzles together during our weekly family game night, they decided this was one they wanted to practice on. Now of course Declan quickly lost interest as he hasn't quite reach the puzzle point. Dane had a blast with the flash fact cards which came with the puzzle too! It worked out quite well because next item had to be the Winter Lights Book! All three kids (yes all three) sat together reading the book while pointing out the beautiful features of winter that they were excited about. The synopsis says, "The Pteranodon family celebrates the beginning of winter with a trip to the North Pole! This Little Golden Book retells an episode of the PBS Kids show Dinosaur Train in which Buddy the T. rex and his siblings get to see the amazing Aurora Borealis!" Although the stickers have yet to come out of the package the kids are excited to put these on the walls in their new rooms (once we find a house). Right now we have a lot of their rooms starting to be packed up for the move so we didn't want to bother potentially messing these ones up. 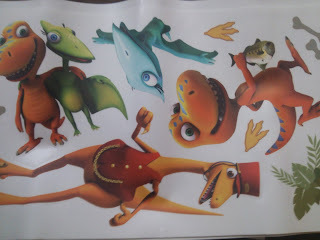 Last but definitely not least was the We are a Dinosaur Family DVD. This has of course been their favorite as my children love taking turns picking movies at night to watch before bed. The great thing about this one is that they don't fight over not wanting to watch it on the nights it isn't their turn to pick! 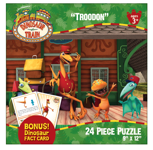 $4.99 “Troodon” 24-Piece Jigsaw Puzzle at AC Moore, Christmas Tree Shops and other independent retailers. Recommendation: Personally I think this whole series is adorable! All the kids like them and everything is listed at a low retail price. I think there are great lessons in watching the programs and each of these items encourages learning! 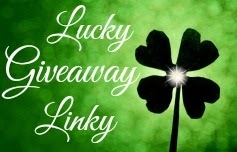 Giveaway: Jim Henson Company is going to give one of A Lucky Ladybug's lucky readers the same variety of Dinosaur Train Products to have of their own! I would give this to my grandson! His favorite character is Tank Triceratops! I'd love to see more giveaways like this for toddlers! Some ride on toy type giveaways would be great, too! I would give this to my son. He has so many dinosaurs. If you ask his favorite, it usually is different everyday. Today his favorite is an Allosaurus. I would give this to my son and his favorite is Buddy! my toddler! she loves Buddy - she stomps up and down the hall roaring like a t-rex! I would give this to my twins! I would give this to my grandson, whose favorite character is Buddy. I would Give this to my Granddaughter Megan...She Loves Tiny the most. I would give this to my daughters. My one daughter says she like the orange one and the other daughter likes the blue one. They don't remember the names. Lol. I would love to win this for my daughter. She doesn't have a favorite yet. My daughter would love this. I think she likes Buddy . . . This would be for my son and he loves Buddy! My grandson would love this! Buddy is his favorite. My godson would love this! 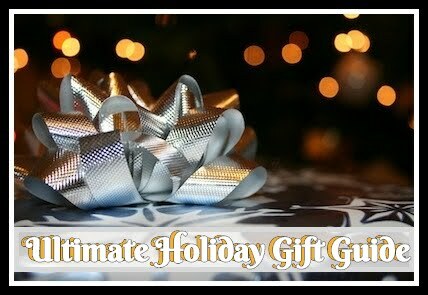 You have the best giveaways!! This would be for my nephew and I have no idea which dinosaur he likes. I would give this to my grandson. He is a fan of the program and will run into the room the second he hears the opening song, however, I do not know if he has a favorite dinosaur. I would love to win this for my niece. She loves the show. My daughter, She loves all Triceratops. I'd give this to my little cousin. She is obsessed with dinosaurs. I have no idea what her favorite is, but I know she knows more dinosaur names than I do. i would give it to my son. i like triceratops. My kids they will love it!!!!! I would give this package to my son who loves dinosaurs!